Sin and Punishment takes place in a grim, dystopian future. The year is 2007 and humanity is struggling with a worldwide famine. As a solution, scientists have developed a new, genetically engineered species to raise as livestock. They were herded in northern Japan until they mutated and began attacking civilians. These creatures were dubbed “Ruffians”. An international militia calling themselves the Armed Volunteers have tried to stop the creatures. Unfortunately, their campaign has seen them take advantage of their success by oppressing the Japanese people. In response, a rebel group led by a woman with mysterious powers named Achi seeks to defend Japan against both the Ruffians and the Armed Volunteers. Her group is seen by the Japanese as their last ray of hope. Within her ranks are Saki Amamiya and Airan Jo. Saki has received a blood transfusion from Achi, which has granted him strange powers of his own. With two enemy factions to fight, they will need any advantage they can get to survive. Anyone familiar with this game will stress how important it is for newcomers to play through the tutorial. Before it’s over, the player will get a sense of just how much different Sin and Punishment is from a typical action game. It is best described as a rail shooter in a similar vein as Star Fox. That is to say, the main character, Saki, moves forward independent of your own input. Sin and Punishment is a decidedly odd example in that you control human characters on foot rather a vehicle. This means you typically do not have the entire screen with which to navigate Saki, for he is subject to the Earth’s gravitational pull. As such, he must instead jump or roll to dodge enemy attacks or any other hazard. Luckily, as if to compensate for being tethered to the ground, he possesses the curious ability to jump a second time while in midair. He is also a bit more survivable than an aircraft in a typical shoot ‘em up title in that he has a health bar. Sin and Punishment also stands out with its control scheme. The control pad or the appropriate “C” buttons are used to move Saki left and right. Jumping is accomplished with a press of either shoulder button. 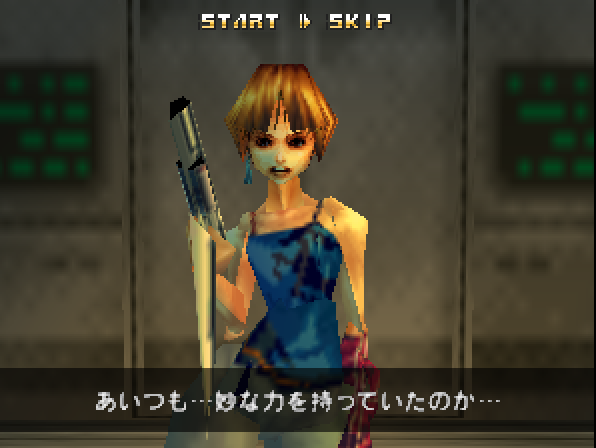 As is befitting for a rail shooter, Saki’s primary method of defense is a firearm called the G&R-M64-JPC DOLPHIN POLICE STANDARD. It shoots infinite bullets made of pure energy. 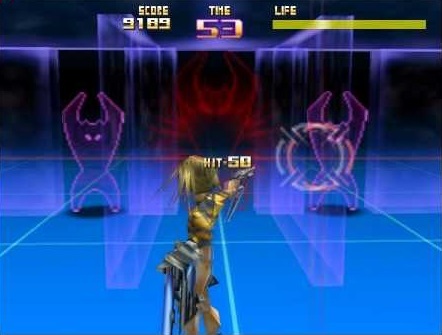 The player uses the “Z” button to shoot. On top of this, the gun doubles as a sword for close-quarters combat. By tapping the “Z” button when an enemy is close by, Saki will slash the enemy in an instant. With the “C” buttons and control pad dedicated to movement, the control stick is instead used to aim Saki’s gun. Players can choose between manually aiming at the enemies themselves or a system that locks onto an enemy the cursor touches. These two modes are switched by pressing the “A” button. Though the auto-lock makes aiming easier, the Dolphin has little destructive power in that mode. Manual aiming will allow Saki to inflict more damage with ranged attacks, though a well-placed sword attack is usually the most devastating. Being a rail shooter that takes place on the ground, the level design is quite interesting. Backgrounds in a typical shoot ‘em up usually exist for aesthetical purposes. In Sin and Punishment, you will often have to take the environment into account when you’re planning your attacks. For example, in the second stage, you can opt to destroy the platform on which the enemies are standing than waste time gunning down each one individually. From the very beginning, Treasure had prided themselves in their unique boss fights. Gunstar Heroes famously had a boss fought fairly early that had seven different forms. 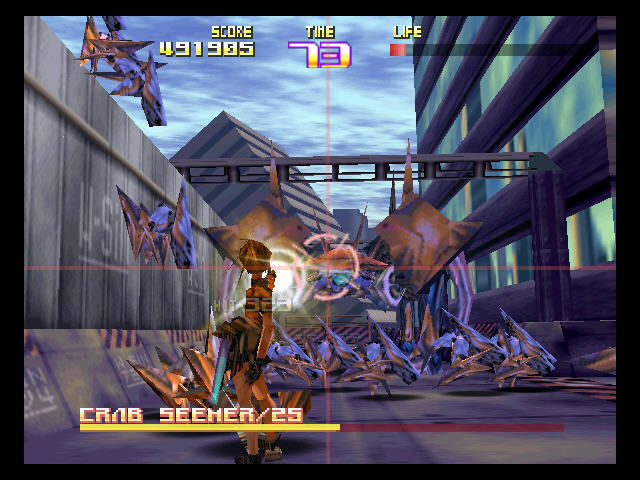 Alien Soldier took this trend to its logical extreme by having the entire game revolve around boss fights – discounting the nominal segments connecting them. 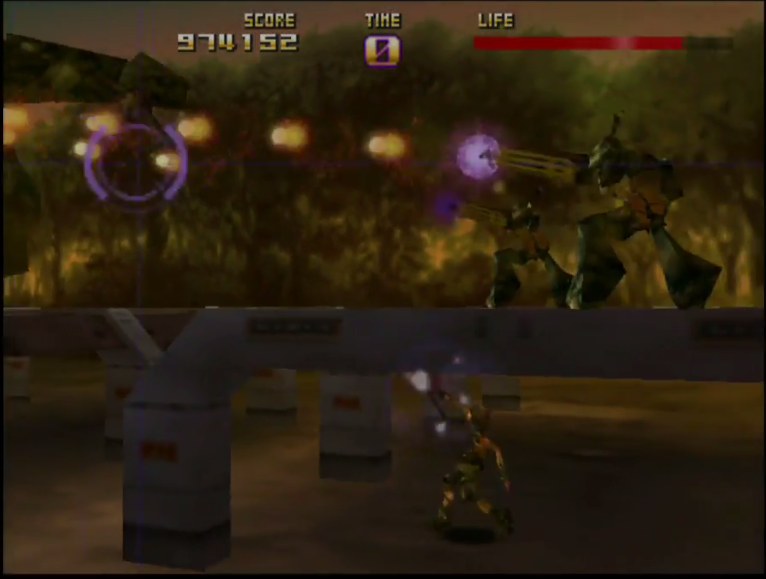 Though Saki and Airan are often made to fight cannon fodder courtesy of the Ruffians and Armed Volunteers, a significant portion of the game is spent in boss encounters. Like Alien Soldier, there is a great variety to the boss fights. In the span of one game, the player will have encountered the Armed Volunteers’ war vehicles, Ruffians of various shapes and sizes, and heavily mutated monstrosities that were once human. A commonality between them is that they emphasize the importance of studying patterns and reacting accordingly. These fights often require the player have a good sense of timing as well. The sword isn’t just used to launch a powerful close-range attack; it can also reflect certain projectiles back at the opposition. In fact, some bosses can only be felled by launching their attacks right back at them. Because you have no control over your character’s forward momentum, I have to give this game a lot of credit for its lightning-fast pacing. Even when you’re returning to the boss you lost against, you are never waiting around for something to happen. In fact, the game is downright brutal – especially on higher difficulty settings. You will be constantly on the lookout for anything that looks remotely dangerous. In fact, it’s best to assume that something capable of damaging your character is headed their way at any given moment because such a belief is never far from the truth. You even occasionally have to worry about a boss’s underlings swarming the player during certain encounters. 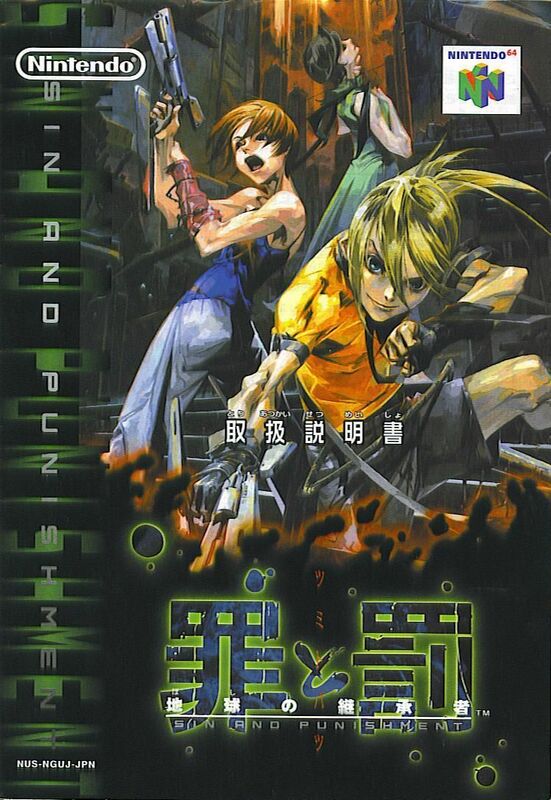 Though Sin and Punishment is quite the daring game for 2000, it does have a lot of weaknesses. While the NES controller could only be controlled with one’s thumbs, the SNES’s own controller, which introduced and popularized shoulder buttons allowed players to use their index fingers as well. From here developers had to think carefully of how their control schemes allowed for simultaneous actions at a given time. After all, no sane developer would assign the ability to jump to the “SELECT” button. Because said button is usually activated with the left thumb, it would all but ensure the player’s inability to move and jump at the same time. I bring this up because the biggest immediate issue most players will have with Sin and Punishment concerns its control scheme. Though it might not be immediately obvious from my description, the controls are highly unorthodox. It’s not as though the developers were unaware of this problem either – Mr. Maegawa himself believed the game’s difficulty lied in players being unable to understand it. 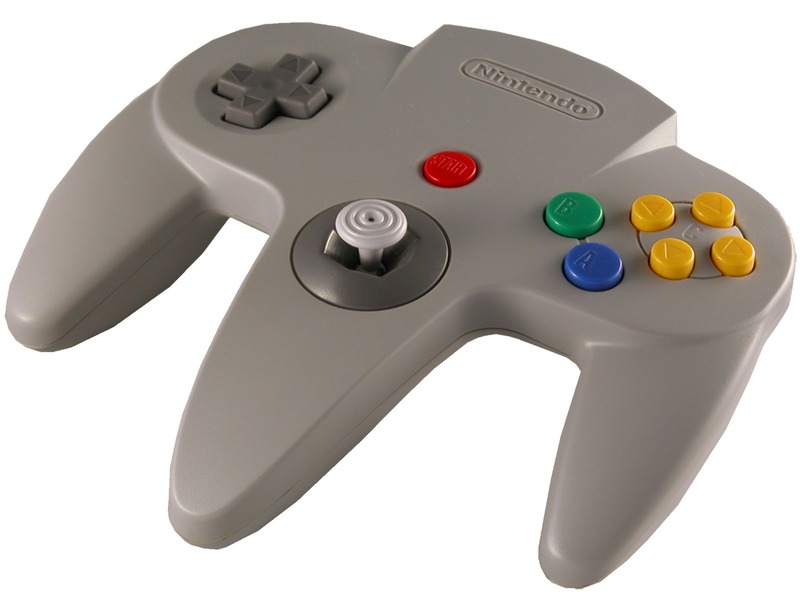 In the interest of fairness, I will admit this in of itself isn’t a bad thing – in fact, given the odd shape of the Nintendo 64 controller, all games on the platform had strange button layouts to some extent. However, even as these three-dimensional games became more ambitious, the savviest developers limited the number of functions each hand could perform for optimal performances. This is where Sin and Punishment falls short – playing it reveals just how much the controls defy conventional sensibilities. Depending on your perspective, the developers either assigned too many functions to the right hand or made a game that tends to be too busy for its own good. This is the kind of game that begs to have a second analogue stick or control pad, but the Nintendo 64’s controller only has one of each. The function of a second analogue stick is replicated somewhat when using the “C” buttons or control pad. The former doesn’t quite work because there are two superfluous buttons in between each of the ones used for movement. Meanwhile, the latter method doesn’t fare much better because it takes your hand away from the control stick, making it hard to aim the gun. This means if you want any chance of dodging enemy attacks, you cannot afford to wait until the last minute – even if your character does have the ability to roll out of the way. Because the “C” buttons and control pad are used to move while the shoulder buttons are used for jumping, the player’s first order of business is to learn how they can perform both actions in unison. There’s no straightforward answer either – you might find yourself having to hold the controller in a strange fashion to have any success. While Mr. Yamaguchi correctly deemed the earliest builds of Sin and Punishment too difficult, it doesn’t change that quite a lot of the challenge in the final product lies in wrestling with the controls. As a direct result, Sin and Punishment has a terrible habit of giving the player too many things to focus on at once. The reason a typical rail shooter has you control some kind of vehicle is because it greatly simplifies the act of maneuvering, allowing you easily focus on both shooting and dodging. 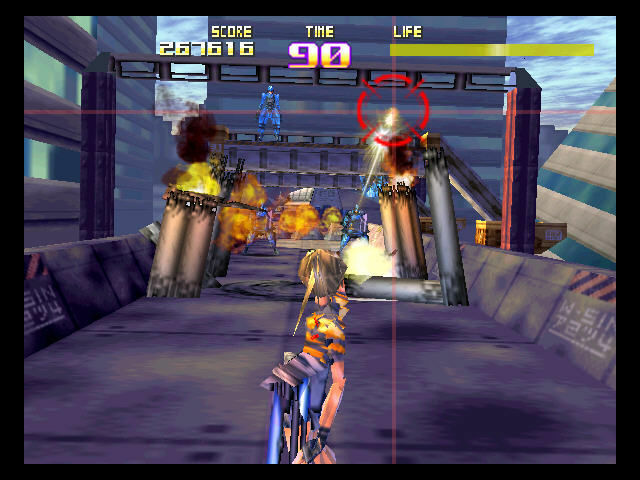 By making a rail shooter in which you control a human character, you have to worry about hazards on the ground in addition to the enemies’ ranged attacks. Don’t be surprised if during your first attempts playing this game that your character takes damage from enemies you failed to notice. One could switch to the automatic aiming system to make hitting their mark easier, but the damage it inflicts tends to be pitiful. In case this hypothetical player decided they didn’t mind and sought to turn these encounters into a battle of attrition, the time limit hanging over their head would thwart any attempts at doing so. While letting it run out doesn’t immediately kill your character, it does cause their life meter to drain. Only by adding time to the clock can you prevent your character’s inevitable demise. The premise on which the game is based has caused many people to declare Sin and Punishment the spiritual successor to Contra – particularly the series’ third installment. This makes a lot of sense, as many of the same programmers were behind both games. In fact, Treasure was founded from former Konami employees. One of the final stages places Saki in an environment that emulates the style of 2D platforming games. Though it’s a nice shout-out, I would argue this is where the issue with the controls reaches its apex. The button layout only barely worked for a rail shooter, but applying it to a genre that lives or dies based on its controls makes it untenable. If you have the patience to stick with the game to the end, you will have effectively resolved two conflicts at once: the fictional one that pits Saki and Airan against the Ruffians and Armed Volunteers and the meta one that pits you against the control scheme. In case one was expecting the plot to salvage the experience, I can’t say that it does. It begins innocently enough, but things go off the rails when Saki finds himself face-to-face with Kachua, one of the Armed Volunteers’ highest ranking members. After this, a sea of blood floods Tokyo. Just when it looks as though Saki has drowned, he instead transforms into Ruffian and proceeds to battle against a transformed Kachua. When Saki wins, Airan eventually confronts Brad, the Armed Volunteers’ leader. Brad falls shortly thereafter whereupon Achi reveals that she was evil all along. She is not from Earth, and the war between the Ruffians and the Armed Volunteers was a test to breed Saki into the ultimate soldier. From there, he would be used in a cosmic battle against extraterrestrial beings. I can imagine it’s difficult to keep up with the plot after reading these descriptions. Though I did heavily abridge the major developments, the truth of the matter is that the plot isn’t any more intelligible as you’re watching it unfold. More than a few people have likened Sin and Punishment to the anime End of Evangelion with its constant plot twists and out-of-nowhere developments. I can certainly see the connection given that both works tend to make things happen without any rhyme or reason. The sea of blood flooding Tokyo in particular is quite ridiculous because of how spontaneous and poorly foreshadowed it is. This game shrugs off such an anomaly as though it were a simple rainstorm. It’s a shame the plot tends to be as incomprehensible as it is because I actually like the two lead characters. In light of the game’s short length, they aren’t exactly developed well, but they do have a nice, little dynamic to them. I also found myself enjoying how the story defies the player’s expectations with them. It’s easy to get the impression that Airan is Saki’s sidekick, yet she’s the one who deals with Brad. Saki himself only succeeds in dispatching Kachua, Brad’s second-in-command. He is counted on to wage the final battle against Achi, but that was after spending a significant chunk of the game predisposed. Even if the story has myriad execution issues, I do like how complicated the conflict manages to be. The rebels have to fight against two enemy factions. Even if they and the Armed Volunteers have a common enemy in the form of the Ruffians, they cannot work together due to the latter’s oppression of Japanese civilians. The Ruffians themselves are divided into two groups – those controlled by Achi and the ones engineered by Brad to fight back that have gone berserk. It seems to show that there was room for advanced stories – even in action games. Then again, the confusing nature of the plot could be seen as a sign of the many growing pains the medium as a whole underwent attempting to evolve. I have little doubt Sin and Punishment was a good game for its time. In terms of presentation and action sequences, very few games could match it in 2000. The English voice acting may have been rather stilted, but it wasn’t a bad effort – especially when one considers its initial lack of availability in North America. Back when the game was released on the Virtual Console in 2007, I could understand why fans wanted it released in the West so badly. Between its creative boss fights and surprisingly deep conflict, it managed to be impressive even seven years after its initial release. It certainly has gained quite a following over years like many other Treasure games. Unfortunately, unlike their Genesis efforts, I personally feel it has not aged well. The biggest obstacle when it comes to recommending Sin and Punishment is its bizarre control scheme. It really is unlike anything the medium has seen before or since, and its Virtual Console release only barely alleviates its worst aspects. Usually, it’s a good thing when games possess unique qualities, but there’s no getting around that anyone attempting to delve into Sin and Punishment – or even those revisiting it several years after the fact – are going to spend an inordinate amount of time adjusting to the controls. This wouldn’t normally bear commenting on, as adjusting to a new control scheme is something even veteran enthusiasts must do on occasion. However, the problem arises when you realize the skill you will build up playing Sin and Punishment doesn’t translate well to other games. Anyone who plays Half-Life can use what they learned to play other first-person shooters. Conversely, the skills one develops learning how to play Sin and Punishment are only applicable to playing Sin and Punishment. At the end of the day, if you’re seeking a quality rail shooter from the Nintendo 64 era, you would be better off playing Star Fox 64. It has far more intuitive controls, a better difficulty curve, and a comprehensible plot. Moreover, while Star Fox 64 used the platform on which it was released in a meaningful way, Sin and Punishment wouldn’t have felt out of place in the arcades. There’s nothing wrong with bringing an arcade experience to the consoles, but Sin and Punishment didn’t provide enough content to have justified charging the same price to purchase as Super Mario 64 or Ocarina of Time. ← A Question for the Readers #10: Something Bugging You? I never played the N64 game, just the Wii sequel, but I guess I am not missing much. Honestly? Not really. It may have a cult following, but even what little I’ve played of the Wii sequel indicates that it is indeed the superior effort. As it turns out, an intuitive control scheme counts for a lot. Yeah, the Wii game is a good one. I really like this game. I keep coming back to it every once in a while, and I have a blast. I still have to agree with everything you have to say here. The controls are very unintuitive, and it’s unlike most anything else you would have built skills up in in the past. And the plot is totally just a series of unconnected random thoughts that don’t even make any sort of internal sense. And it’s an incredibly busy game. So much is having all the time that it’s near impossible to keep completely on top of it. But yeah, I do really like this. It hits a really good spot in me. When I get to that sort of flow state in this game, it just feels so good to get things going, to be hitting those moments of constant reaction and movement and energy that seems to bypass conscious thought. It’s not a state I’m able to get in or always enjoy with a lot of other games that seem to be going after that, but Sin and Punishment gets there for me really well. I have to admit the action in this game is indeed pretty solid, and it is a fun title just to revisit without having to be in a right frame of mind beforehand. It’s just that the controls are something of a deal-breaker for me (or if they’re not, they’re dangerously close). In such a busy game, the last thing you want is to wrestle with the controls for any reason. And yeah, when it comes to the plot, it feels as though they never got past the drafting phase. Even with all of its problems, I can totally be on board with a good argument as to why somebody would like it such as your own. Its flaws weren’t to the point where I could outright condemn it.